Welcome to the Precision Flight Team website. With a mostly new team, we are excited to enter the 2007 season and do our best as we lead the new members through their first PCIFA experience and build up a strong base for next season. As the practice sessions ramp up in anticipation for the competition in February, our spirits are high and we may yet pack a formidable wallop. After a very brief (7 monh) delay, the pictures are finally up for your perusal. $15 gets you 2 pasta entrees, salad, and garlic bread, and $5 gets you 6 raffle tickets, which you can put intoward a variety of prizes. Proceeds go toward the Flight Team. Everybody is welcome to come for a night of food and fun, and at the same time help us out with competition-related costs such as airline tickets, ground transportation, lodging, and entry fees. A huge thanks to the SCV 99s for putting this event on for us! Click on the above link for RSVP info. Latest News: We have returned to flying status and are going to NATIONALS! We recently finished 2nd place overall in the 2006 Region II Safecon! Click here for official results. Congratulations to ERAU Prescott (1st place), Mt. SAC (whom we edged out by just a few points) and all the other teams who made it a fun event. Special mention to Mike Meschi for placing #3 in the Top Pilot ranking. Way to make us proud! 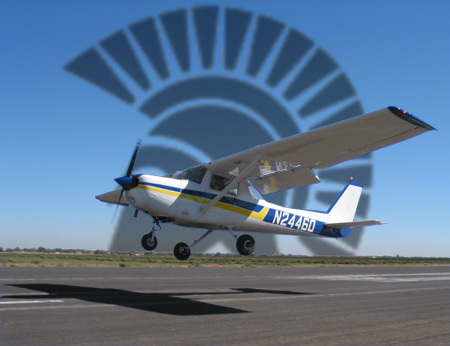 The Precision Flight Team is a student-run organiation that takes part in several competitions against teams from other Universities across the country in NIFA (National Intercollegiate Flying Association) and PCIFA (Pacific Coast Intercollegiate Flying Association) air-meets. The team is comprised of students from San Jose State University, and we have received numerous awards in the past years. Money for competitions is raised by donations from the community, and from several fundrasing events throughout the year.